The extraction for this one's been sitting on my laptop for over two months, since I thought the idea and image cool but really have no idea what to do with it. I just thought it time that I do something. This wall I submit with a sigh of resignation -_-' . The original scan is two pages with a gap in the center that cuts through Luffy's right hand and foot, and cuts off the edge of his samurai suit. I filled in the gap by copying, extracting, rotating, resizing, etc other pieces. Hope it's not too obvious. The koi-ish thing I extracted from another wall, so my apologies to Rem of Menagerie. Quote by dazookiegah, it's luffy and he's not looking stupid! Cool pic. The armor looks relly nice. The detail is nice as well. Keep up the good work. Ah loved the samurai spinn-of (well, page ^^ ), great wall too! 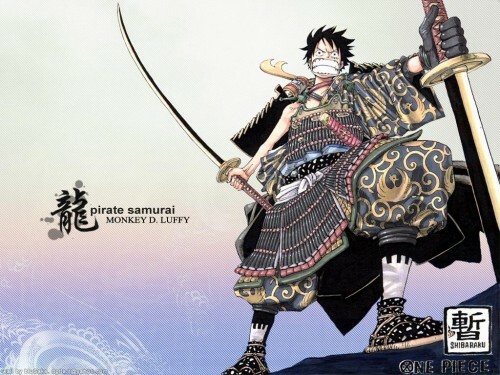 Luffy looks really cool, but at the same time he looks really funny wearing such big armor. Nice one , good job ! U've merged the 2 initial pieces of the scan very well and the bg looks good too. hahahahha pirates and samurais together!!! WHAT HAS THE world COME TOO hahahaha! ANyways good job! hahahaha luffy in a samurai outfit never thought i'd see this! Rock 'n Roll! This rules! He looks kinda fat(?) when wearing that armour. Anyway, nice bg and layout for this one.